Duccio di Buoninsegna (c 1255–1318), The Raising of Lazarus (1310–11), tempera and gold on panel, 43.5 x 46.4 cm, Kimbell Art Museum, Fort Worth, TX. Wikimedia Commons. The start of our journey through some of the wonderful art of the Middle Ages relied on ‘miniature’ paintings made on vellum and included in religious manuscripts, and the embroidery of the Bayeux Tapestry. There are surviving wall paintings, including frescoes, but most are in a sorry state of repair, and their details all but vanished. Thankfully the situation changes radically once we consider works completed between 1100 CE and the early Renaissance after 1300: there are many wall and panel paintings to study. I will first offer a small selection to show how they evolved, then focus on the common theme of the New Testament story of the miracle of the Raising of Lazarus, and trace that through time. Almost all these paintings come from Italy; I will look at the early paintings from northern Europe in a future article. 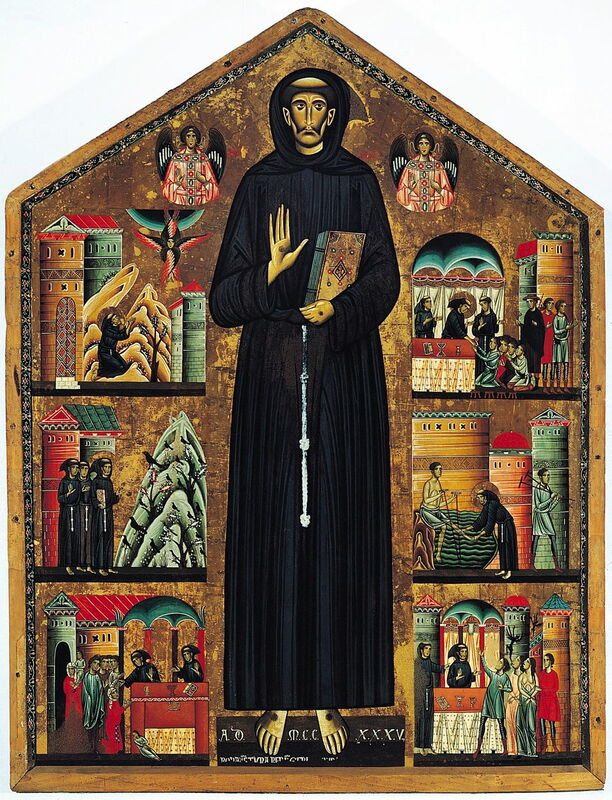 Bonaventura Berlinghieri, Saint Francis of Assisi and scenes of his life (1235), tempera on wood, 160 × 123 cm, San Francesco, Pescia, Italy. Wikimedia Commons. Bonaventura Berlinghieri’s panel painting of Saint Francis of Assisi and Scenes of His Life (1235), from the altar in Pescia, must be one of the most beautiful objects created before the Renaissance. Around the central figure of Saint Francis are six scenes. Reading from the top left they represent him kneeling in the wilderness, where he had his vision and received the stigmata (marks of crucifixion on the hands and feet, as shown in the central figure). Below that is the episode in his life which is perhaps remembered by most, when he preached to the birds, then at the bottom a miracle in which he healed a girl with a dislocated neck. On the right are three of the miracles attributed to him: that at the top is the ‘miracle of the pear’ in which Saint Francis coaxed a crippled boy to stand by holding out a pear, as well as a leper who is waiting to be healed. Below that is the healing of a cripple in the waters of a bath, and at the bottom is the casting out of demons. This pattern of showing key scenes from the life of a saint was to become an established approach for many altarpieces and other polyptychs through the Renaissance. Giotto’s (1266–1337) frescoes in the Scrovegni Chapel at Padua show a more elaborate depiction of The Adoration of the Magi (c 1305). The infant Christ rests on the Virgin Mary’s knee; she was originally clad in her signature ultramarine blue, but that has worn away with the years. Mary is accompanied by Joseph and an angel, and the Holy Family is within a wooden shed. 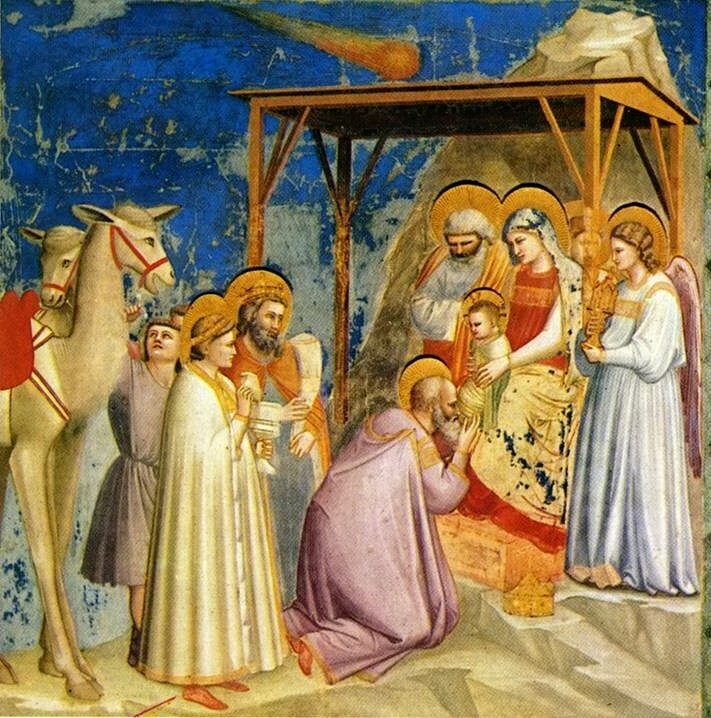 The three ‘wise men’ pay their respects and present their gifts, but are now accompanied by camels and at least two attendants. The comet which attracted their attention is shown as a fireball crossing the sky. Bartolo di Fredi (1330–1409), The Israelites safely cross the Red Sea, but Pharaoh and his troops are drowned (1356), fresco, dimensions not known, Duomo di San Gimignano, San Gimignano, Italy. Wikimedia Commons. Bartolo di Fredi (1330–1409), in his spectacular frescoes in San Gimignano, tackles a crowd scene in his The Israelites safely cross the Red Sea, but Pharaoh and his troops are drowned (1356). This depicts the Old Testament story from Exodus, in which Moses parts the waters of the Red Sea and leads the Israelites across, but their Egyptian pursuers are overwhelmed as the waters return, and drown them. As in most other paintings of the period before the development of realism during the Renaissance, di Fredi painted the elements and symbols within the story, but did not attempt to cast them into an imagined reality. On the right, the Israelites are making steady progress on the carpet of dry land which Moses provided them. On the left, the Egyptians are in the water, emphasised by the presence of fish and fishermen in the background. 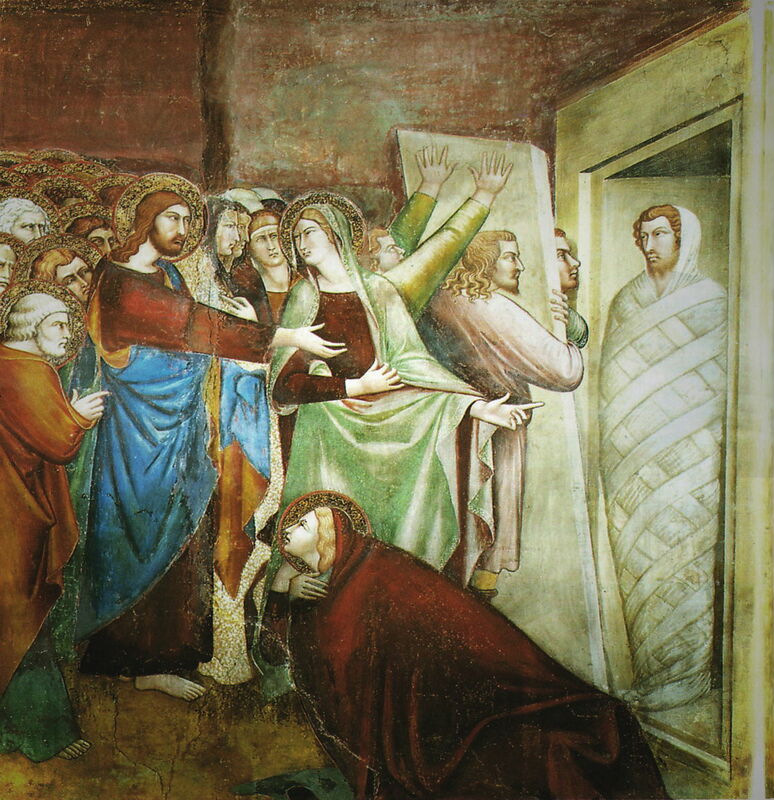 The story of Lazarus is one of the more popular miracles in the New Testament, although it is only contained in the Gospel of Saint John (chapter 11, verses 1-44). Christ is told that Lazarus has fallen ill, and his two sisters seek his help. However, Jesus tells his disciples that he intends waiting for Lazarus to die, so that God can be glorified. He then delays for two days before returning to Bethany, by which time Lazarus has been dead and buried for four days. His sisters and the village are still in grief and mourning, so Jesus asks for the stone covering Lazarus’ tomb to be removed. Jesus them commanded Lazarus to come out of his tomb, and Lazarus emerges, still covered in the linen cloths used for burial. Jesus tells the people to remove those cloths and let him go. 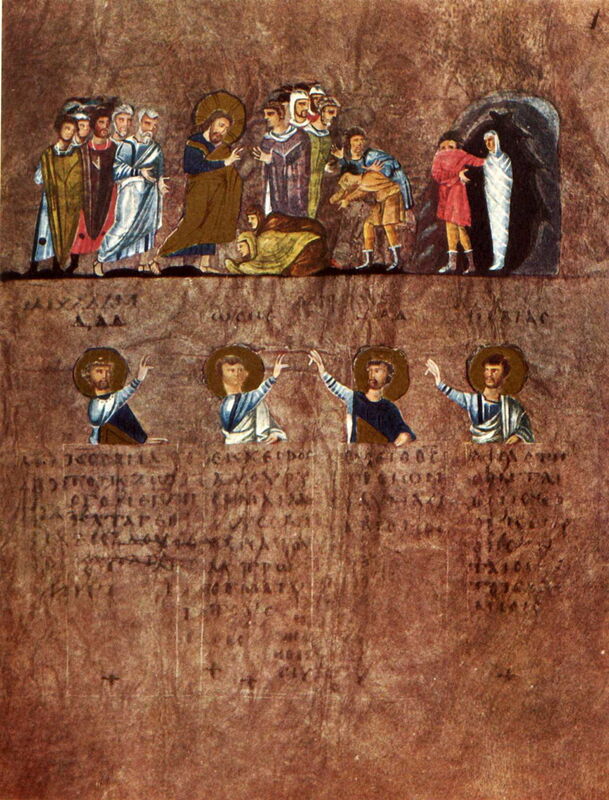 The Raising of Lazarus from The Rossano Gospels (c 550 CE) shows this in a continuous strip, with Lazarus’s sisters pleading at the feet of Christ in the centre. At the left are his disciples, and at the right the completion of the miracle, with the tomb opened and Lazarus emerging, alive in his funeral bandages. This is a simple story told simply and very effectively. Anonymous, Healing of the Blind Man and The Raising of Lazarus (c 1129-34), fresco transferred to canvas, 165.1 x 340.4 cm, originally at Castile-León, Spain, now The Metropolitan Museum of Art, New York, NY. Courtesy of the Metropolitan Museum of Art. The righthand section of a fresco from the church of San Baudelio in northern Castilla, Healing of the Blind Man and The Raising of Lazarus (c 1129-34), tells this in a single image (as it does for the healing of the blind man on the left, too). The moment shown is the removal of the stone from a coffin-like grave, revealing Lazarus underneath. In choosing just this single moment in time, the painting relies on the viewer being able to add the previous events, and to resolve the story of the miracle, just as is required for the blind man on the left. 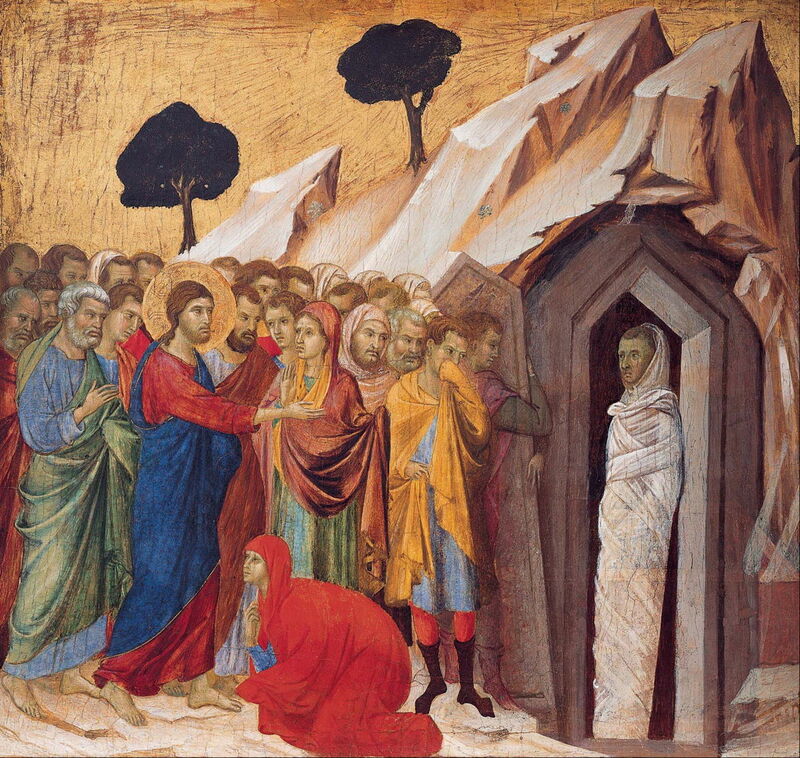 Duccio (c 1255–1318) opts for more complexity, in his marvellous panel painting of The Raising of Lazarus (1310–11). Lazarus’ two sisters are shown pleading with Christ, reminding the viewer of the start of the story, but at the right the stone has been removed from the tomb, and Lazarus appears alive again. Although Duccio has painted some wonderfully realistic faces, there is barely a glimmer of any expression on them: they are frozen in serious mode, even that of the sisters and Lazarus. However he has started to show some body language, with hands held out, and one bystander holding his cloak to his nose in case the opened tomb stinks. Giotto di Bondone (1266–1337), The Raising of Lazarus (c 1305), fresco, approx 200 x 185 cm, Scrovegni Chapel, Padua. Wikimedia Commons. 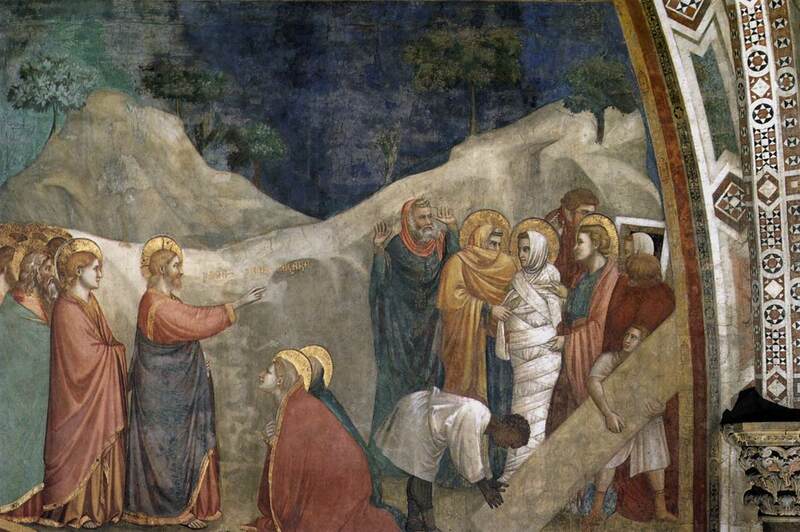 Giotto’s early version of The Raising of Lazarus (c 1305), one of his frescoes in the Scrovegni Chapel, Padua, uses a similar composite image to tell the story. At the left, Lazarus’ sisters remain at Christ’s feet, but at the right the stone has been removed and Lazarus – still not looking in the best of health – has emerged from his tomb. 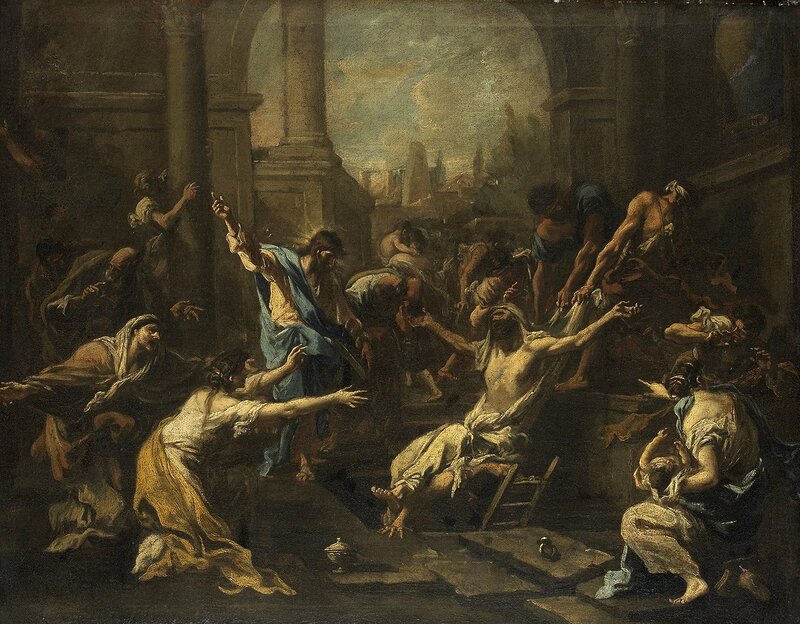 Many of the figures have their arms raised or active: Christ’s in blessing Lazarus to achieve the miracle, others in amazement, but facial expressions are still fixed and devoid of emotion. 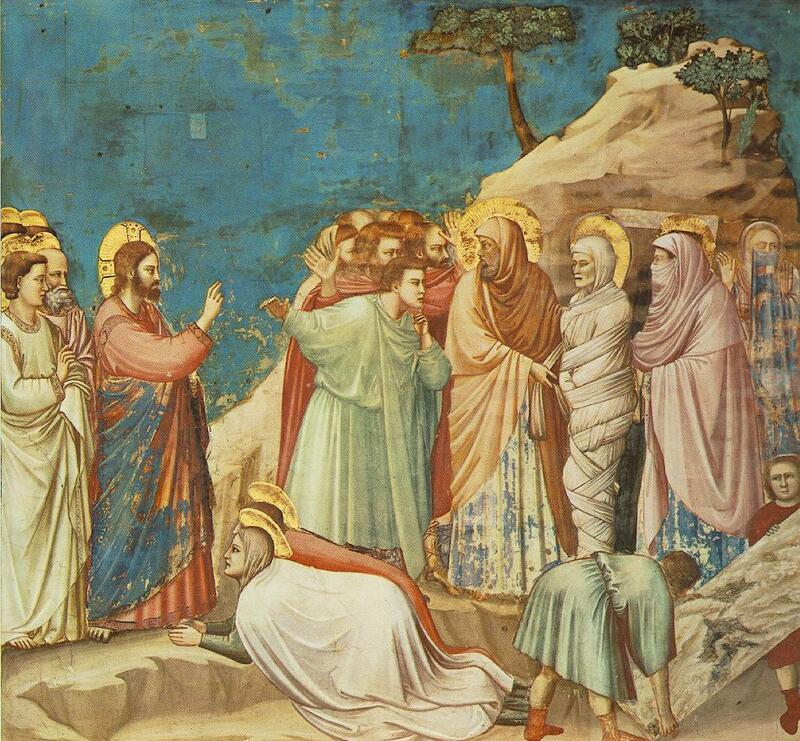 Giotto di Bondone (1266–1337), The Raising of Lazarus, from Scenes from the Life of Mary Magdalene (c 1325), fresco, dimensions not known, Lower Church, San Francesco, Assisi. Wikimedia Commons. 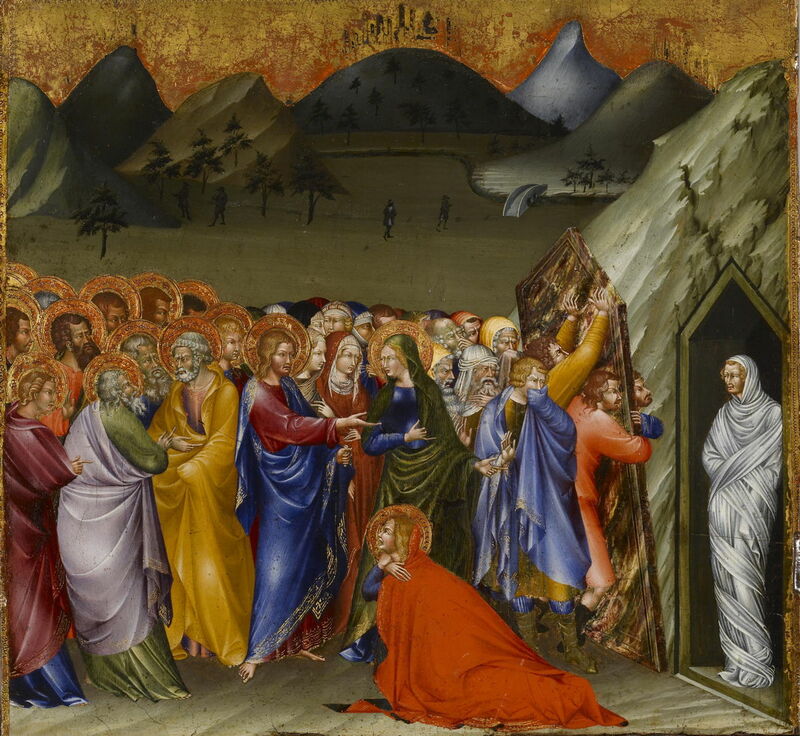 Giotto’s later version from Scenes from the Life of Mary Magdalene (c 1325) in the Lower Church of San Francesco at Assisi, has similar narrative elements, but the crowd is now tucked away off to the left, to be replaced by a more developed landscape. Some of the faces are now modelled to show what appears to be the beginnings of emotion: Lazarus’ sister looks to have been weeping in grief, for instance. Lippo Memmi (1291–1356), Resurrection of Lazarus (c 1325), fresco, dimensions not known, Duomo di San Gimignano, San Gimignano, Italy. Wikimedia Commons. Giotto’s high reputation is well deserved. Here Lippo Memmi (1291–1356) has painted his Resurrection of Lazarus (c 1325) in his frescoes at San Gimignano. His figures are much older in style, with simpler modelling of their faces and garments. His approach to the narrative is made more difficult, as Christ, Lazarus’ sisters, and the tomb are squashed together. Lacking separation in space, it is harder to envisage them as being separated in time, which could confuse some viewers. He does, though, use ample body language to help tell the story. Giovanni di Paolo (1403–1482), The Resurrection of Lazarus (panel from predella in San Domenico, Siena, Italy) (1426), tempera and gold leaf on panel, 40.5 x 43.5 cm, Walters Art Museum, Baltimore, MD. Wikimedia Commons. Giovanni di Paolo (1403–1482) painted his The Resurrection of Lazarus (1426) a century later, when the Renaissance was in full swing. But this panel from the predella in San Domenico, Siena, is still firmly rooted in Duccio’s panel, even down to its composition, and the chap covering his nose with his cloak. The positions and colour-codings of the various figures are remarkably similar, although di Paolo has started to elaborate their hair, clothing, and landscape behind. Narrative painting continued to thrive during the Middle Ages, although surviving European examples are almost confined to telling stories from the Bible. Continuous or composite narratives, in which more than one moment in time is shown in a single image, were popular, and even in quite simple compositions proved effective, and not confusing. However, they rely to a degree on spatial separation, and may become more confusing in more condensed images. By the time of Duccio, around 1300, some painters were using body language very effectively in their narratives. However, facial expressions were little used until the rise in realism of the Renaissance. Most earlier paintings which modelled faces realistically used fixed neutral expressions throughout, although Giotto’s later paintings were starting to show more emotion in faces. The best artists of the Middle Ages created superb paintings by any standards, even though they did not wish to depict any literal reality. Posted in General, Painting and tagged Berlinghieri, di Fredi, di Paolo, Duccio, fresco, Giotto, Memmi, narrative, painting, realism, renaissance. Bookmark the permalink. I have fixed an initial problem with viewing enlarged images on this page: that feature should now work properly. My apologies for this temporary glitch.